Ark Angels is pleased to offer pet sitting Garner and the surrounding areas with full-service, in-home pet sitting. Two of our staff members live and work specifically in the Garner area, providing dedicated service 365 days a year from 6:30 a.m. to 10 p.m. Our Garner-area pet sitters have extensive knowledge and experience in caring for dogs, cats, birds and other exotic pets. 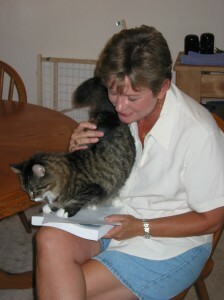 Our service sets us apart from other pet sitters. True animal lovers, we care for your pet as carefully as we care for our own, giving special attention to every detail. We monitor pet health and behavior during our visits and have the capability to serve pets with special health care needs (such as diabetes). While caring for your pets, we will keep in touch with you while you are away. Our service includes a full written report on the care we provided in your absence, but when possible we will also send you a photo or video greeting from your pet. This is only one of the ways we demonstrate our commitment to you and your pets. We know you have a choice when selecting pet care in Garner, Clayton and the surrounding areas. We are dedicated to providing excellent service and want to earn your continued business. For petsitting in Garner, call Ark Angels Pet Care!